The challenge on Less is More´s blog is to use more than one stamp! I used a background stamp with text and the poppies from Blooming Garden, Penny Black and the sentiment from Simply You,Technique Tuesday. I´ve made two cards with the sweet "Birthday Girl" from Penny Black! This one for a student graduation in Sweden, blue and yellow is the colors of our flag! It´s my turn to hostess the MIX-ability challenge on Splitcoaststampers this week! My challenge is to use liquid glue to create some texture to card! It´s so fun! You can find the challenge HERE. On the first I used Artgraf Water Soluble Carbon Disc for creating the background. Added glue with a hot glue gun and then applied Gesso to it. On the second card I applied glue to the branches with my hot glue gun. Used a stencil and Modeling Paste for the small white dots. On the third card i applied liquid glue on a white paper and let it dry. Then I sprayed colors on it. The die and stamp is from CAS-ual Friday´s! The challenge today on CAS-ual Friday´s blog is to "create a Guy card with the following catch...you can't use kraft as a color at all, AND you have to include some sort of ribbon". Here´s mine with a tie made with Satin ribbon! Stamps from Penny Black, "Lost without you" and "Amazing"
Made this card for Simon Says Stamps Wednesday challenge , Anything goes! Here´s my card with this peaceful stamp "Rowboat and Dock", so serene and calm! art stamp set "Art cling set" again from Serendipity Stamps! Love it! Here´s my card for the challenges "Case this Sketch #77" and "Addicted to CAS #39 -Texture"! I used this lovely stamps from Serendipity Stamps, Art Cling Set! The 25th means that newest Greenhouse Society stamp set is ready to start shipping from Technique Tuesday! Here you can find projects made with the new May Day stamp set! Here´s two more cards from me with the lovely set! The challenge on Less is More´s blog this week is a recipe, to include a DIE CUT! That is a perfect challenge for me to use my new die cuts!! On this card I´ve used the lovely Fuchsia die and one of these Leaves dies from Penny Black! The sentiment is from Penny Black´s Lost without you! CAS-ual Fridays shop! There you can find lots of lovely stamps and dies! I choose Casual Comfort and Casual Trees Fri-Dies! Lovely! Here´s two card with them! I used the new Tulip die "Dainty"and sentiment from the stamp set "Amazing" from Penny Black! I turned this lovely scene "Winter Homestead" from Serendipity Stamps to a Summer scene! :) Some of the trees are placed on 3D foams! Love this Floral Butterfly Stamp & Die Set and Dream die from Serendipity Stamps! Embossing Folder Stamping, add color to an embossing folder and use it as a stamp! The other was a CAS challenge, Water! Word die from Penny Black, Hooray and the drop is a stamp from Stamps by Ryn. Here´s my card for CAS(E) this sketch #76! There is a theme challenge on Less is More´s blog today, FLOWERS! I´ve used my new Tulip vase and the Imagine die from Serendipity Stamps! They have so many beautiful stamps! 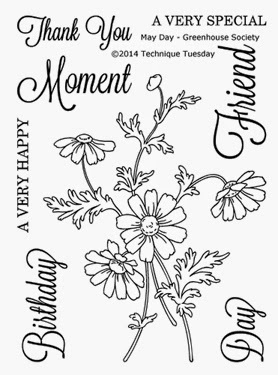 Here´s a card for the MIXability challenge on Splitcoaststampers , use reverse masking! I used my new beautiful Olive branch and text from Serendipity Stamps! Love them! It´s time to show the new lovely stamp set from Greenhouse Society stamp club, Technique Tuesday!! You can find more inspiration on the BLOG! Det är min tur att blogga på Pysslotekets blogg idag! Butiken hittar du HÄR!